We found this to be a fascinating book, and given the continuing use of pesticides on our farmland it’s a timely one as well. The book tells the story of the Knepp Estate in West Sussex, and how a considerable area of it was allowed to reinvent itself by the simple expedient of being left alone. The way the land, as well as the wildlife that depends on it, regenerated and flourished really is a feel-good tale. Mechanised farming had run its course on the estate, so the decision was made to basically leave things alone and see what happens. It was a brave decision, that’s for sure, because no-one could be sure about the outcome, but it was one that has been amply rewarded. While the land itself became what we might think of as unkempt, the hedges, bushes, trees and grassland began to attract more and more wildlife. Without herbicides and pesticides to stunt any future development, many rare plants started to appear, plants that would have been unable to survive in the past. Insects began to appear in greater numbers, various species of fungi have thrived and the snake, bat and deer populations are all on the increase. It’s a fascinating project, and it’s one that’s beautifully documented by Isabella Tree. Like all landscape gardeners in Scotland and across the world, we at Brown Earth Landscapes are all too aware of the importance of a thriving bee population, so when a book comes along celebrating all things bee, we just had to have a look. 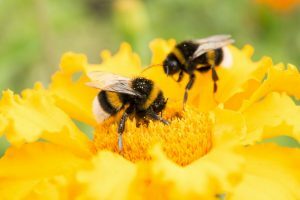 The decrease in suitable bee habitats and the increasing use of pesticides has left the world’s bees struggling to maintain numbers, and we as a society will suffer because of this. One of the more fascinating aspects of the bee’s contribution to the world is the fact that around a third of the food items we eat rely on bee pollination to survive and thrive. If you thought the bees only gave us honey, it’s time to think again. Next time you eat items such as apples, almonds, lettuce, chestnuts, cucumber, onions and raspberries, for example, you might want to say a silent thank you to the bees. This book offers a fascinating insight into this incredible insect, and you come away at the end with a greater appreciation of our furry little friends. It doesn’t just focus on one species, either; the bee is found all over the world so we’re given plenty of information about their global presence. Given the fact that their numbers are declining, this is also a well-timed reminder that we need to celebrate and cherish this remarkable creature.